1. In 2000, the total volume from felling operations exceeded 15 million m3 of rough timber for the first time in history, but the volume of timber skidded by cableways did not exceed 300 thousand m3. The latter is only 2 percent of total felling within a terrain of gradients over 40 percent and terrains with unsuitable carrying capacity for tractors (peatlands) representing at least 10 percent of the total forest area. 2. There are about 90 forest cableways of different types known to be in operation at the present time and most of them are of obsolete design. Modern cableways of domestic production (type LARIX) are gradually beginning to win the local market. 3. The changing conditions of forest management put an even greater emphasis on environmentally sound logging technologies, and there is no doubt that cableway timber skidding is one of the best methods from an environmental point of view. The changing conditions of Czech forest include the shrinking size of clear-felling elements, advocating of more environmentally sound methods of management, i.e. that the shelterwood selection is winning preference over the regeneration clear-cuts. If the natural conditions allow, the shelterwood system can work with natural regeneration. Difficult and steep terrain requires the use of cableway skidding. In these difficult terrains, the method of natural forest regeneration by means of cableways usually pays back with greater ecological and economic effects than the method of artificial regeneration, since the clear-felling system on steep slopes brings considerable risks for the forest environment and is more costly. 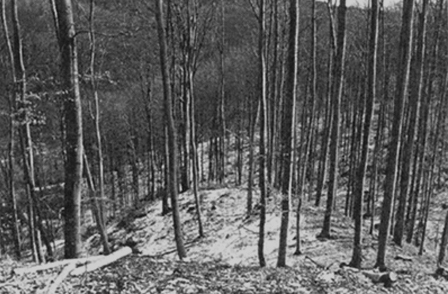 However, this can be avoided by using suitable silvicultural procedures, such as strip felling (by Prof. Polanský) with a forest cableway of modern design (see Photo 1). A modern cableway must be highly mobile and quick to assemble; its efficient use engages at least about 50 m3 of timber in one single logging operation. Also, a standard cableway must be equipped with radio control right from the place of load fastening in the stand since this is the only way to choose work procedures with the minimum damage to self-seeding, advance growth and standing trees of the parent stand. Model working procedures and necessary principles that reach the objectives of natural regeneration of stands using LARIX cableway skidding can be demonstrated with the example of long-term successful natural regeneration of beech stands at the Training Forest Enterprise Masaryk Forest Křtiny (TFE Křtiny) of Mendel University of Agriculture and Forestry in Brno. The Enterprise was founded 78 years ago as a multipurpose facility serving mainly the Faculty of Forestry and Wood Technology to ensure pedagogic, research and verification requirements. TFE operates 10 406 ha of forests, which form a continuous complex immediately situated north of Brno. The forest stands are situated at altitudes ranging from 210 to 575 m. Average annual temperature is 7.5 °C, mean annual precipitation amounts to 610 mm and to merely 360 mm during the growing season. Parent rock is granodiorite in the western part of the Enterprise, Devonian limestone in the central part, and Culmian greywacke in the eastern part. The topography is heavily broken with conspicuous deep valleys of the Svitava River and Křtinský Brook and with numerous side valleys and glens. Slopes with gradients over 34 percent take up a quarter of the Enterprise area, a good reason for being professionally interested in forest cableways. Diversity of natural conditions is considerable and incomparable for such a small area in the Czech Republic. Mixed stands prevail in that region, in which 48 percent are coniferous tree species and 52 percent are broadleaf. Main tree species are spruce, pine, larch, beech and oak. The TFE Křtiny has a long tradition in the application of feasible methods of forest management specialized in the use of natural regeneration. Environmentally sound forest management methods have been applied over a long period, including the system of small felling areas and its forms of shelterwood regeneration and regeneration by border felling, as well as the application of selection forest management principles. Many famous foresters have worked here, such as Leopold Grabner, Chief of the Forest District, managing forests formerly owned by the family of Liechtenstein; he introduced a project in 1848–1897 in which the forests were aligned and, every ten years, repeatedly treated in five elaborates of forest management plans to the Saxonian area control system by Cotta. Clear-cuts were gradually reduced and compartment shelterwood felling introduced. Great emphasis was put on all tending measures which were neglected up to that time. Another outstanding forester was Julius Wiehl, who devised a modern management plan at the turn of the nineteenth and twentieth centuries, in which a system of balanced age classes and management by stands was introduced. Julius Wiehl adopted a shelterwood form of the small-scale management of even-aged stands. The method augured a natural conception of the forest that would be steadily creative and sustainable. The foresters working with the TFE forests in modern history and today are Professors Konšel, Haša, Opletal, Polanský, Doležal, Vyskot, Tesař and Kantor, who contributed to the detailed precision of a special method of beech management in a shelterwood system, i.e. regeneration of beech stands by group shelterwood felling which gradually melts into border cutting. The method has markedly expanded in the last ten years, even in difficult terrain, as a result of the application of LARIX cableways. Good management of beech stands at the TFE is also documented by the fact that it is the only forest facility in the Czech Republic with the Woodmark FSC Certificate for raw and sawn timber, awarded to the facility four years ago. The special method of beech stand regeneration and tending applied at the TFE aims at a maximum utilization of natural regeneration and increment from the release. The beech stands are regenerated at a relatively long (up to 40 years and more) regeneration period. Since the present rotation period is 130 years, the first advance growths emerge as early as at the stand age of 90 years. Therefore, it is necessary that conditions be created for the rise of self-seedlings and subsequent shelterwood felling already when implementing the last tending measure. The stands to be regenerated are to be divided by approximately 100 to 120 m by inserting cableway routes, i.e. strip clear-cuts whose width should be 4 to 5 m.
There is a principle to be observed at the measure implementation: that the entire strip width is not cut before the proper cableway timber skidding takes place, but is only the narrowest slit possible to enable the operation of a cableway about 3 m wide. This is eventually widened to the required width of the strip felling by Polanský only after the entire logging operation has been accomplished. This is how trees along the line can be removed, which were possibly scratched while serving as fenders at skidding. Then the felled stripcut becomes a starting point for the natural regeneration which shifts under the parent stand from below. The logging is made in the context with shelterwood felling, the intensity of which decreases from the cableway line edge into the stand inside. This shelterwood treatment is made along both sides of the cableway route and results in the removal of mainly large-diameter trees with ill-shaped stems or crowns from the main stand level up to a distance of 20 to 30 m from cableway reach. Qualitative trees with perfect crowns and good growing characteristics are left in the stand for seed. By selecting the ill-shaped large-diameter trees, we release main-level and sub-dominant trees of smaller diameter, which respond to the release with increased light increment on qualitative mass. Research indicates that the increment can fully compensate production losses often recorded at the selection of large-diameter trees. The consistent and timely selection of large-diameter trees, together with the reduced rotation period, help to prevent the development of red core, which can result in great economic losses. At logging, we principally save the sub-dominant trees which influence the stand microclimate for the sound development of advance growths. After the stand has been gradually felled and ensured, there are other fellings inserted into the original system of strip felling, which gradually results in complete regeneration of the whole stand. The described system of beech stand management is a good example of qualitative increment management, and there are a number of examples in the stands of TFE Křtiny, which prove the validity of the method described above. The driving and transport unit is the farm tractor classed from 45 to 70 kW. Skylines can do timber skidding in semi-suspension or full suspension in diverse terrain - both in a classic way up the slope from the stand towards the skyline tower and from the tower down the slope. A possibility of timber skidding on flat ground exists for sensitive terrain, particularly in protected areas (see Scheme 1). The LARIX cableways are designed as implements on an agricultural tractor - where a part of the cableway is carried on the rear three-point linkage (tower and winches) and another part (drums with running line) is carried on the front three-point linkage. Thus, the cableway's weight is evenly distributed onto the two axles, which renders the tractor with the cableway mobile even in difficult terrain. Terrain accessibility of the farm tractor with the suspended skyline is nearly identical to that of a special forest tractor. The site for the cableway does not need any special treatment; acceptable longitudinal and transversal terrain gradients for tractors with cableways installation are up to 15 percent. Cableway reach is up to 600 m, carrying capacity 3 000 kg, yarding force 32 kN, weight up to 4 500 kg. The cableway is equipped with five cables: skyline, endless line, hoist line, slack-pulling lines and straw line. The system with endless line makes it possible that loads during transport need not be braked by the haul-back line, and it is very simple to direct the carriage with or without the load. Targeted automation for hauling in or hauling back the carriage is standard equipment. The line can be pulled out from the carriage up to a distance of 70 m.
1.1 System with skyline, endless, hoist, slack-pulling lines and special carriage to hold the fully suspended load in a horizontal position. 1.2 System with skyline, endless, hoist and slack-pulling lines; direction of timber transport to the cable tower. 1.3 System with skyline, endless, hoist and slack-pulling lines; direction of timber transport back to the cable tower. 1.4 System with skyline, mainline and gravity carriage. The TFE Křtiny maintains a long tradition in the application of environmentally sound management methods in forest stands by using natural regeneration. The high rating is made possible not only on the basis of assessments made concerning existing forests in concrete production conditions but also concerning the long life of the forest stands and complex evaluation of their history. Nor are decisive operations in the forest neglected, such as logging and skidding technologies, which include forest machines, transport accessibility, forest protection, execution of hunting rights and, of course, also concerning forest management itself. Recent practical experience indicates that LARIX cableways are a good helping hand in ecological and sustainable forest management because of their suitable technical parameters (see Table 1).